Step up to the deck railings of Almost South I and breathe in the fresh Ocean air! 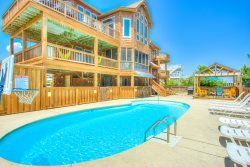 The upper unit of this comfortable Oceanfront duplex, Almost South I is perfect for a small family getaway. Located just a quick walk away from the shared walkway to the beach, your family will love the convenience of being Oceanfront for more beach time. The interior of Almost South I is just as inviting as the setting, and features ample room to relax and take in those salt breezes. Relax with the family in the living area, dining area, and nearby kitchen, or find your own private haven in one of three tastefully appointed bedrooms. For a real treat, step outside and enjoy those salty breezes, or stroll to the oceanfront via the long beach boardwalk. With so many ways to enjoy the ocean setting, Almost South I is a celebration of life by the beach. Have a larger family group? Combine with Almost South II to enjoy a larger family getaway. Provides opportunities for the fisherman in your party. Save $100 instantly when both units are booked simultaneously.